This spring we joined a Tuesday afternoon homeschooling group for their final six week session. The kids are split into two groups, 1st-3rd grades and 4th-6th grades, that spend an hour on one subject and then switch subjects for the second hour. This spring it was art and soccer. Soccer was pretty straight forward, but it's the art class format that I'd like to share! Julie, the teacher, shared a little about an artist and one of their primary styles of art, then she had an activity planned that allowed the kids to try out the artistic method. So simple, so genius! Above, you can see a sample of some of Elizabeth's renderings: Picasso/Cubism, Seurat/Pointillism, Escher/Patterns (two projects), and Van Gogh/Impasto (thick chunky paint that they mimicked with clay on cardboard). Sadly, Elizabeth missed the watercolor week. If you like that art display rod, it's a wire curtain rod you can pick up at Ikea for $12.99; Colin gets the credit for that great idea! Our group has adjourned for the summer, but it occurred to me that I could continue with Tuesday art appreciation and projects! I got the wonderful book to the right at the beginning of the school year, but haven't really used it ... until now. Wa-hoo! Embarrassingly, there are project ideas in the book I could have taken advantage of. There's a brief two-page description of an artist including examples of his/her work with suggestions of how you might try it out. 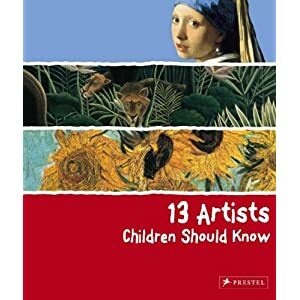 This book in conjunction with Julie's art class have taken away the feeling I need to be an expert in art to teach or share it with my children. Today we read about Henri Matisse and gave a some free-hand silhouette collage a try. Elizbeth really got into it, while Brian mutilated a piece of black paper with scissors and then glued and taped a piece of yellow construction paper into a wad ... completely missing the point of the lesson while thoroughly enjoying himself in proper two-almost-three year old fashion! There are so many beautiful art styles out there using such a variety of media! You can get online too, and do a Google image search of an artist's work, even if you can't get to a museum. We'll have to save our field trip to Matisse's museum in France for another day, but that didn't mean we couldn't enjoy him this morning! Three Signs that Summer is at Hand!